Gujarati Methi Thepla is a famous breakfast made from wheat flour & fenugreek leaves. It has a sweet & spicy taste reminiscent of Gujarati cuisine. It is made flat like a roti & then roasted on tava using oil. They are a perfect breakfast item as well as travel food. It stays fresh at room temperature for 2-3 days & so you can pack it for your holidays. It tastes best with pickle or chutney or curd. 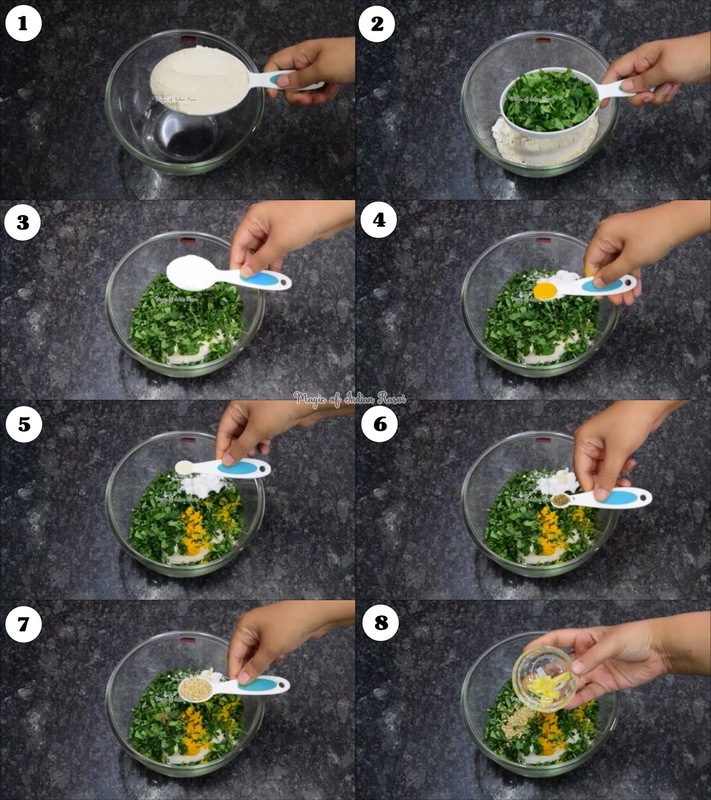 It is easy to make & with this recipe you can make enough theplas for 2 people. 1. 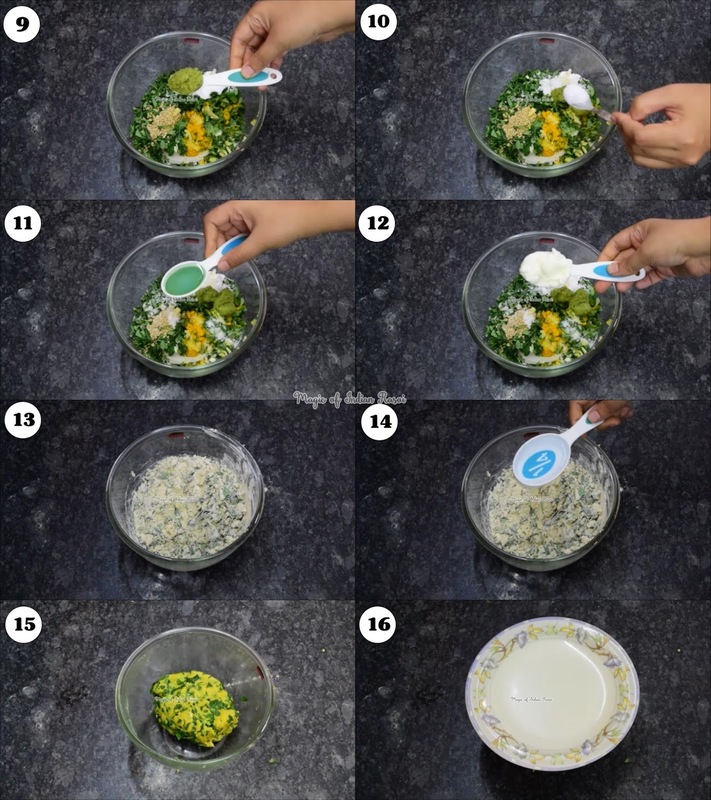 In a large bowl mix wheat flour, finely chopped fenugreek leaves, powdered sugar, turmeric powder, asafoetida, carom seeds, sesame seeds, grated garlic, ginger-green chilli paste, Salt, oil, fresh cream. 2. Using required water knead medium soft dough like paratha - I have used 1/4 cup water. 3. Knead dough for about 1 min. 4. Cover & allow it to rest for 3-4 hours. 1. Knead dough & make it little smooth. 2. Take a small dough ball like roti. Using wheat flour for dusting roll it thin like roti. 3. Put thepla on hot tava & keep flame on high. 4. When bubbles appear on top turn it over. 5. Cook on other side too on high flame till bubbles appear. 6. Lower flame, turn thepla over & apply 1/4 tsp oil on both sides & roast by lightly pressing the thepla. 7. Shift thepla to a casserole. 8. 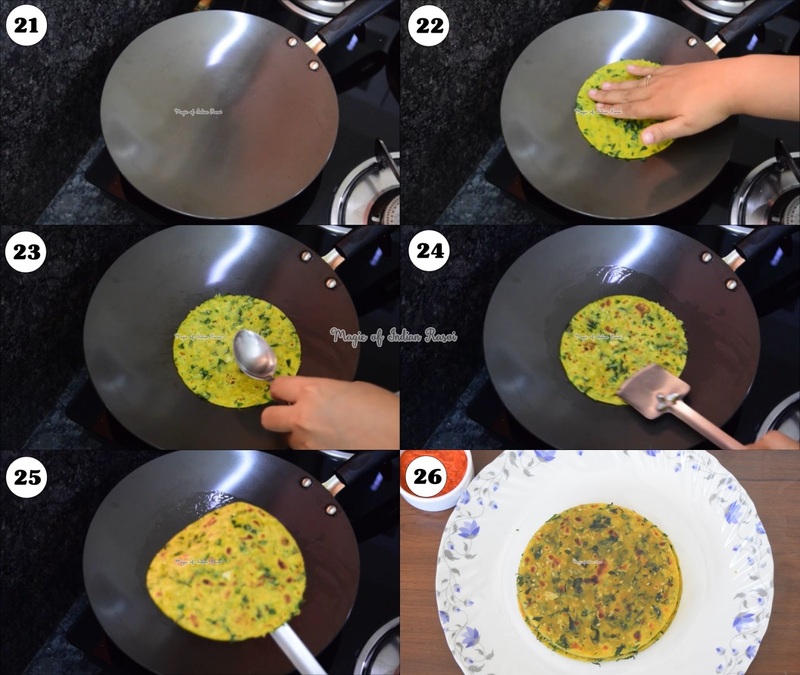 Prepare remaining methi thepla in same manner. 9. Famous Gujarati methi thepla is ready - serve it with pickle/curd/chutney. 1. 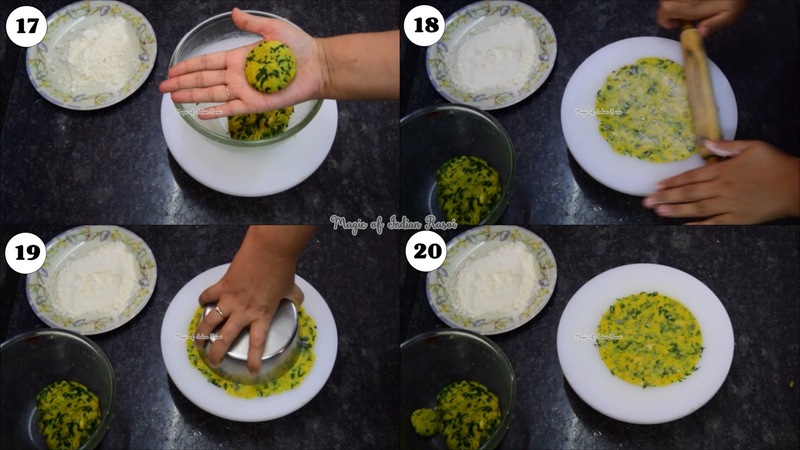 You can prepare dough in night & keep it in refrigerator to use in morning. 2. If you are planning to take theplas on holiday skip fresh cream/malai to make it last longer. Theplas stay at room temperature for 2-3 days! 3. Theplas are thin like roti unlike paratha which is thicker - ensure to roll it in thin shape. 4. Ensure not to press hard thepla while roasting or it may turn hard.